A strong brand increases customer intimacy, advocacy, retention, and sales while lowering the cost of acquisition. You'll also attract the best staff and be invited to bigger and better parties. Brand Development is essential to differentiating your company from your competition. Branding allows you to reach the right audience, entrench yourself in a marketplace, and ultimately rise above the other businesses fighting for the very same audience and customers that you are. You may have great products and services, but without a clear brand strategy, you’ll be challenged to capture the attention and the imagination of your audience, which limits your ability to grow. Here are seven ways branding will position your business for long-term success. While products and services fulfill a need, branding creates an emotional connection. Because it taps into something deeply felt, it makes your business more recognizable and memorable. When you create a brand that stands for something, consumers will stand behind it, acting as your brand advocates and ultimately using their spheres of influence to expand your customer base. Branding transforms your business into something that is able to make perceived and/or actual improvements in some aspects of the customer’s sense of self and their place in the world. Through its purpose, character, and promise, a successful brand is able to achieve relevance in the minds of the consumers. No matter how good your products are, without branding, customers are less likely to trust you. All quality companies have brands, and today’s customer expects that of you if they are going to do business with you. Essentially, your products are only as credible as your brand. We see examples of the way a brand creates premium value every day in the aisles of drug stores and supermarkets. Brand-name products sit on the shelves right next to generic brands of comparable quality, yet the brand-name product commands a significantly higher price. People will pay more to do business with or buy a product from a trusted, recognized brand. With a strong, consistent brand in place, your value proposition is clear and the underlying emotional promise is compelling. As a result, your marketing efforts become more focused and intentional, and the messages they communicate are more likely to cut through the noise and reach your target market effectively. This reduces costly marketing waste and produces exponential returns on your marketing dollars. As your customer base grows, this group will become a self-powered marketing tool, loyally advocating and championing your brand. Naturally, individuals want to associate themselves with quality and success. A good brand is far more likely to be successful than an amorphous company. It will attract employees who will be proud to work for you and what your brand stands for, and it will interest distribution partners who will be motivated to sell your products and services. 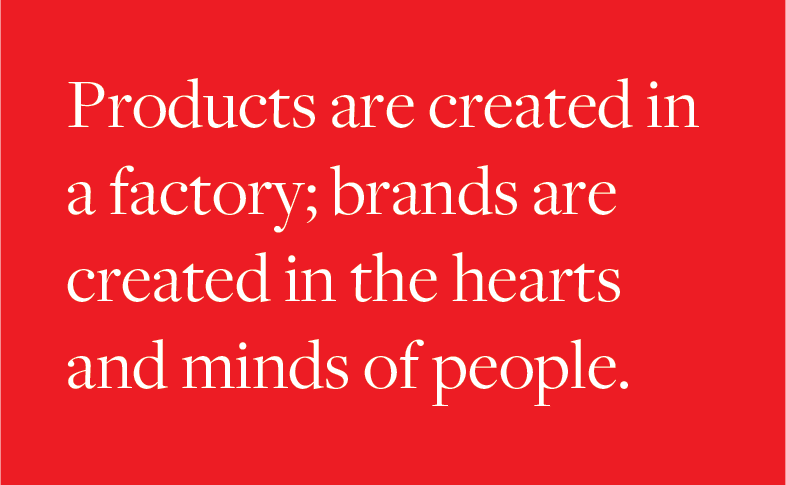 Products are created in a factory; brands are created in the hearts and minds of people. Transforming your business into a brand allows you to tap into the real drivers of your business and retain a loyal following. Previous: Choosing a Branding Agency	Next: What is a Brand Strategist?